This week's challenge: For a full week, make a conscientious effort to save money by using some of the tips provided. Then shift your savings to organics! Since we buy groceries for the entire week on Saturday morning, I spent last Friday night planning our shopping trip. Our weekly grocery budget is $100. [update: Kim was surprised at our food budget, so here's an explanation: we eat very little meat. we only buy chicken and eat it as a meal every other day. we eat lots of bean dishes in between.] My goal was to stay within our normal budget. My strategy was to use the tips for this challenge-- find lots of coupons and pass the savings to the organic items I wanted to buy: eggs, dairy, fruits and vegetables. I spent 2 hours searching for coupons and learning about organic brands (it will be much less time as I get better at this). I was surprised at how many high-value coupons and deals I found for organic brands when I looked at coupon sites like Money Saving Mom, the store circulars where I shop, and the guide at Healthy Child. Even better, I came away with stacked coupons for several brands! We hit two stores armed with coupons, reusable shopping bags and a calculator. There is a catch. The Whole Foods we shopped at does not stack coupons, but they made an exception just this once. 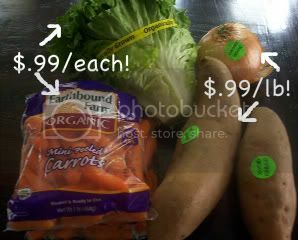 I'm going to have to rethink shopping there because matching up coupons is a big part of affording to shop organic for us. I should also mention that I received a $.60 discount off our bill for using reusable shopping bags. My next goal is to find a way to afford organic meat. Damon heard that Costco has decent prices on organic meat. We happen to have a free membership, but never go...so guess where we went on Sunday? Costco offered two organic whole chicken fryers for $20-$25. Not bad! We didn't purchase any this week because we had already spent our grocery money for this week, but I'm already working it in to week's shopping trip. To learn how you can cut costs so you can afford organic and/or to try this challenge register at Baby Center at join the Easy Organic Living Group. I can't believe that your budget is $100 and that you are able to stay within it. I don't know what it is, maybe Canadian prices (likely) but we are spending upwards of $200. per week and Naveen doesn't even eat much. Here in Greece the cost of living is too high...we regularly spend 200 euros. Good job! I still havent tried the greek yogurt. I have a coupon too. Hope to remember the next time I go to the grocery store. I really like how you are working in the coupons and sharing coupon sites in doing the challenge~I need to do better with that! I read this post this morning and am so on this bandwagon that I ran out to my local Publix and did just so! What an easy concept and so easy to implement. Thanks Teresha. I can't get by on hundred dollars of groceries, but hubby want set down to a mean without meat. That seem to be all he wants to eat.